We have always been in awe of beautiful mosaic and when we bought our home in the autumn of 2012, we were thinking about how we could afford to incorporate them into our living spaces. We needed to renovate both the kitchen and bathroom, as well as tile several floors. At first we asked friends if they had any leftover tiles and we were lucky to get a lot of tiles that way. We then went to a few tile outlets and shops in our area and bought a few especially beautiful ones and tiles on sale. All of these shops were happy for us to take a look in their skips and that is when the real adventure began. We could not believe how many tiles are being thrown out. We found the lovely sheet mosaic shown in the center of the picture. It is lovingly handmade from natural stone, and had been chucked out because one corner had a few stones missing. We also found all the surrounding tiles in a skip. In this way we have been able to make a floor for our kitchen, several walls in our bathroom, (a project in the making) and a tiled fireplace and splash-backs for the kitchen. The next big project is a 40 square meter floor for our new extension, entirely made from salvaged tiles. We can highly recommend a visit to a tile skip in your area. Bring along some heavy duty gloves, ask politely for permission and be careful of all the razor sharp edges, but above all have fun and dream about what you can create with your beautiful finds. You will be doing the earth a big favour in the process. ← Hello world and welcome to the greener dream! This is inspiring Maria, I really want to do this in my kitchen now, hopefully I can follow through! Great idea would love to do this in our bathroom , so now the question is where to start happy days to you love your blog. So happy you are enjoying the blog. 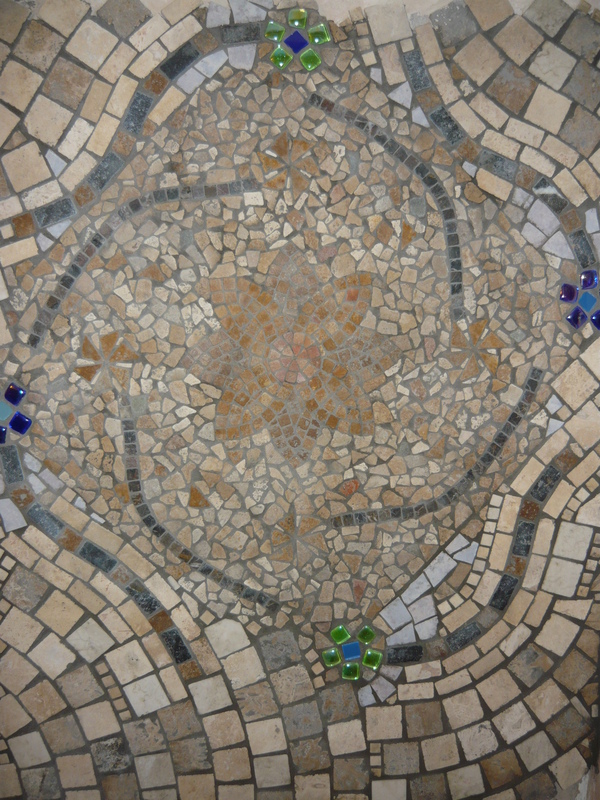 We hope you will give the mosaics a go in your bathroom. Ask any questions you might have and we will try to answer.